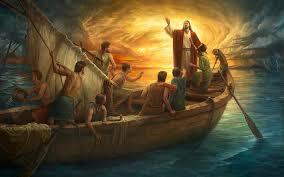 As Jesus approached the storm-tossed boat, the disciples saw Him, but didn’t recognize Him. In fact, at first His presence added to their terror. They thought they were seeing a ghost. Reading their first reaction made me think of the fear-inducing situations I’ve faced. How often has Christ been present in my storm, but I haven’t recognized Him? Was He wearing the face of a person I don’t like all that much? Did He come from a direction I didn’t expect? Perhaps I was so weary from rowing against the wind, I expected nothing but more bad news. When Christ speaks, He seems to ignore the immediate problem, saying, “Take courage! It is I.” If I were the disciples, I think I would have liked to hear, “It’s okay, I’ll tell the storm to stop now,” or “I’ll get in and help you row from here.” Perhaps I’d even appreciate a six-step plan for getting safely to shore. Instead Jesus offers one key thing: the truth that He is present. I want God to respond to my trials with explanations for their existence, clear step-by-step plans for solving them and even a few promises about the value of enduring them. Yet here Jesus gives the disciples the answer He often gives me: “I’m here.” Sufficient. The answer I need. The answer powerful enough to propel me from the boat and onto the water, as Peter discovered as the scene continued. Jesus doesn’t provide a weather report, a new sailing technique or an empty pep talk. He gives me first what matters most: Himself. When fear and panic, shock and dismay are close by, so are you. Maywe always recconize you , Keep us ever in Your watch until these storms of life pass. In you precious name, Amen. Are you in the middle of a storm? call out to Jesus, ask Him into your life. This entry was posted in Uncategorized and tagged Apologetics, Celebrate Recovery, Christian devotions, Finding Jesus, General Devotions, Gods Grace, Help me Jesus, Jesus christ, Matthew 14;24-27, Online Church, Praise, Prayer, Raging Storm, Religion, Web Church, Worship on September 1, 2015 by Rob Lavallee.